An easy way to give your guests or yourself for that matter, a change from the old cocktail is to smoke the entire drink or a component of the cocktail. I’m going to provide you with some examples of how to take any cocktail recipe and advance its flavor to something spectacular. Once you see how simple it is to build a balanced cocktail with smoke infusion as one component, you’ll be ready to upgrade your cocktail recipes to include smoke as your hidden umami. The easiest method of smoking a cocktail is to smoke the finished drink. However, depending on what cocktail ingredients your using, this may result in a drink that is too strong. Generally, speaking, a sweeter drink can tolerate more smoke vapor. Here are some options for you to consider when contemplating a smoked cocktail: you can smoke the entire drink, you can smoke one ingredient of the drink, or you can smoke the water to make the ice for the drink. One of my rules is the more ingredients in the cocktail, the more likely you can smoke the entire drink. For ingredients, any one or a combination of ingredients can be smoked. Simple syrup, cream, citrus, etc. are all good options. Keep in mind that smoke is attracted the most to cold items so if you want an intense smoked cocktail, chill the ingredient first prior to smoking. Tasting Notes: Keep in mind, when you cold smoke using a handheld food smoker, the intensity of the smoke can be high. Due to the immediate ignition of the micro chips, the smoke production is great. You can control the level of smoke by only trapping a small quantity of smoke for a lighter infusion versus allowing the container to fill completely with smoke vapor. Whether the cocktail contains fruit, hard liquor, or cream, you can make a flavorful and desired cocktail. For a drink like the Jack Frost which contains lots of sweet juice and cream of coconut, smoking the entire drink provides great balance. For a drink like the Harvest Sparkle, smoking the simple syrup works well. Our Cranberry Bourbon cocktail goes hardy whether served hot or cold when we cold smoke the whiskey. And the Winter Wonderland enjoys a smoky layer to the cream of coconut for a luscious take on this four-ingredient cocktail. Never forget, when in a pinch, consider simply smoking the water to make the ice cubes for a no-fail option on the smoked cocktail, that will remain subtle for most any guest who is served. More related reading on smoky cocktails and specific drink recipes in our recipe blog! Dr. 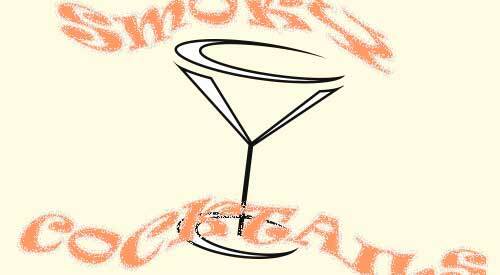 Smoke it is easy to make smoky cocktails with a handheld food smoker! 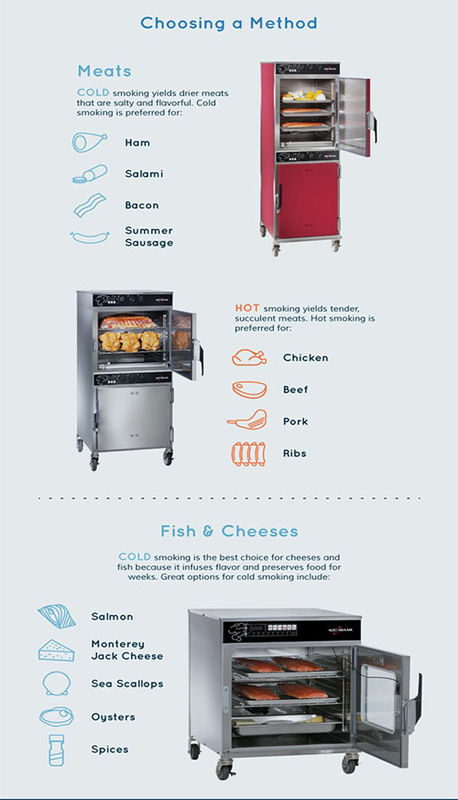 In this article, we are covering our recommendations for smoker equipment; these are cookers that are dedicated for use as a smoker, usually hot smoking at that. As there are always new equipment lines and models released, our plan is to provide regular updates. We also encourage you to send us a message when you don’t see a manufacturer or model listed so we can add this to our listing. 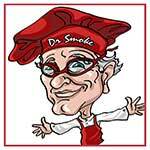 The Good-One™ Smokers model: The Patio Jr.
Dr. Smoke- the Smokers list that we produce wood for is extensive! We can fit our products to your needs. 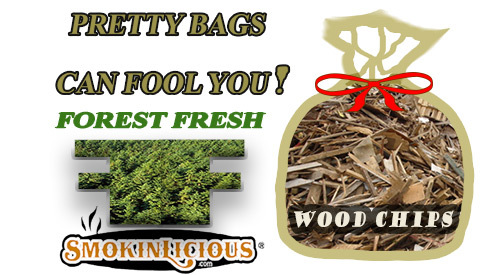 Caution- When selecting wood chips for smoking know the wood source! 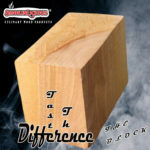 If you’ve ever looked at the wood chips for smoking products available at most discount retail stores, you’ll notice that they seem to have consistent pricing in the $3.99 or less bracket. Yet, you look at the SmokinLicious® brand and come up with a price that’s close to twice the cost. What’s the deal with the price difference? There are many factors involved in determining the retail price of wood chips many of which I’m sure the average consumer hasn’t considered. What exactly are you paying for when you select a specific wood chip brand? The raw material is by far the largest cost factor with selling wood chips for grilling, smoking, and cooking in general. I’ll make the comparison to cotton purchased by a t-shirt manufacturer. There are grades of cotton. Higher grades of cotton go into more expensive cotton clothing. Purchase a $5 t-shirt and you’re guaranteed a lower grade cotton was used. This means you likely won’t get more than a year of consistent wearing and washing out of that $5 t-shirt! The same is true for wood chips. There are 8 different grades of wood or lumber for purposes such as cabinet making, flooring, construction, and pallets. Only one culinary wood company specifically purchases raw lumber material for cooking wood manufacture only. That would be SmokinLicious®. Other companies will do one of three things; have a primary business in one of the areas listed above and use the waste product for producing the wood chips, or, purchase another company’s waste product to market as a wood chip grilling and smoking wood, or, have the company with waste product package a private label brand of grilling and smoking chips and deliver to a centralized distribution warehouse for the brand, something commonly done by equipment manufacturers who feel a need to offer a wood chip to go with the equipment. Another key factor in cost is the handling of the material during the manufacturing process. Now I understand that we are talking about wood and not a food item. However, if you are using a wood to add flavoring to food through smoke vapor from burning wood, then I see the wood as an ingredient. As with any ingredient, I would prefer to use something that is clean and pure since I will be eating this. Since I’ve already pointed out that many companies use materials that are labeled as waste wood, you have no idea how the waste material was collected, stored, moved, and processed. You also don’t know what’s in that waste wood (treated lumber pieces, a mix of woods, some softwoods) or how old that material is which directly affects the moisture level. Remember, moisture is needed to smolder the wood and produce smoke vapor. 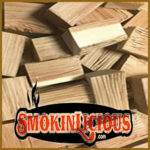 SmokinLicious® is the only culinary wood manufacturer that is Kosher certified, attesting to the steps taken to ensure the culinary products are clean, clean stored, and preserved. One means of keeping cost down is to offer chips that have not been debarked, have not had any mold spores removed, or for that matter dirt and debris. The entire log piece may be placed in a grinding unit which will generate an assortment of chip sizes as well as the dust that comes with this single equipment use. Honestly, you can’t be sure you are getting 100% of the wood listed on the package when these locations are generating extreme volumes of rough grind chip product. The company may simply call it a hardwood chip and not state what hardwood is in the mix. Remember, only specific hardwoods should be used in grilling and smoking. Of course, the variety of wood also can increase the cost. Remember, there are many uses for a wood including the export demand to other countries outside of North America. As with any commodity, higher demands translate to higher cost. Hickory is one of those hardwoods that has become very expensive in the market as the wood is used for railroad ties, utility company pavers to get into mountain ranges, and heavily purchased by the Asian market for a purpose that is not clear. Both the labor involved making the chip product and the location that the chips are manufactured in play a role in determining the cost of the final product. Again, if the chip product is the result of another manufacturing level of the wood like making cabinets, then by using the scrap wood for the “chip” product, the overall cost of the chip product will be lower as labor and manufacturing costs can be covered by the initial cabinet making. If, however, there is no other manufacturing purpose for the wood other than a wood chip production, all manufacturing costs are directed to that chip product. Then there is the question of where the chips are manufactured. Here are some minimum wage costs by the state that will certainly play a role in the final product cost: New York State $10.40, New Jersey $8.60, Texas $7.25, Florida $8.25, Wisconsin $7.25, Michigan $9.25. Other costs that factor in include: how the chips are packaged, the moisture level of the product which directly determines the weight, how the wood is treated for both drying and for pest control, and if there is a screening of the chips to remove wood dust and make the chips more uniform. SmokinLicious® developed over a 3-year period a specialized screen process which allows us to offer 7 different grind levels of wood chips, all bark-free, all from the heartwood of the hardwood only, and all dust free. Perhaps it’s time you take a closer look at that package of $3.99 wood chips and see where it is manufactured, who manufactures it, what the contents of the bag include, and what weight there is to the product. Now that you’re educated on how to assess the value of your next wood chip purchase, the choice will be up to you. 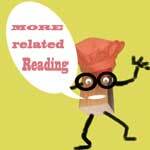 -ELECTRIC SMOKERS: WHEN IS A WOOD CHIP DEAD? 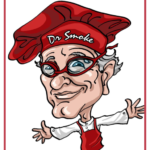 Dr. Smoke- Only buy your wood chips for smoking from a reputable sourcing company! Bratwurst in the Orion Smoker Cooker nicely cooked plump and juicy! I believe that wood fired foods can be enjoyed 365 days of the year regardless of the temperature/conditions outside. To ease the challenges of wood cooking outdoors when the conditions may not be optimal, I look to my equipment options and make a selection that ensures the cooking is quick and as easy as possible. I want to have bratwurst party! Unfortunately, I’ve chosen a -2° day to do just that. No problem! I simply rely on my Orion Cooker to provide a fast, high heat method of cooking with my SmokinLicious® Minuto® Wood Chips. Preparing your bratwurst for the Orion Cooker couldn’t get any simpler than making a few cross cuts in the skins to ensure they don’t burst while cooking. The reason bratwurst is so popular for entertaining and for summer days is just how quick it is to prepare. When you smoke a casing containing product, you want to ensure that the juices don’t cause a pressure build up and result in your brats exploding all over the smoker. I make 3 shallow knife cuts in each brat to ensure they can plump up without exploding out of their casing. These German brats are made with a combination of pork and veal and have an all-natural casing meaning the casing is made from the intestine of an animal. I specifically purchased brats that were on an uninterrupted casing line so I could hang my brats on the Orion Cooker rib hooks to ensure smoke vapor envelopes each link completely, just like commercial smokehouses do. 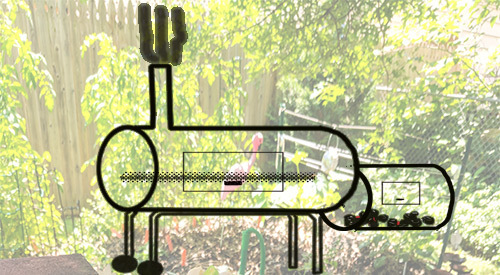 Before smoking my German bratwurst, I’ve prepared the Orion Cooker by adding SmokinLicious® Minuto® Wood Chips in Wild Cherry to inside of the cooker. The wood chips are placed in the space between the cooker’s wall and the drip pan. I’ve lite a chimney starter full of briquettes which when grayed over will be poured into the fuel pan. 12 briquettes are also lit in the smaller fuel pan at that top of the unit. I’ve loaded my strings of bratwurst to the rib hooks of the unit. Next, place the lid on and let these cook and smoke for 45 minutes untouched. 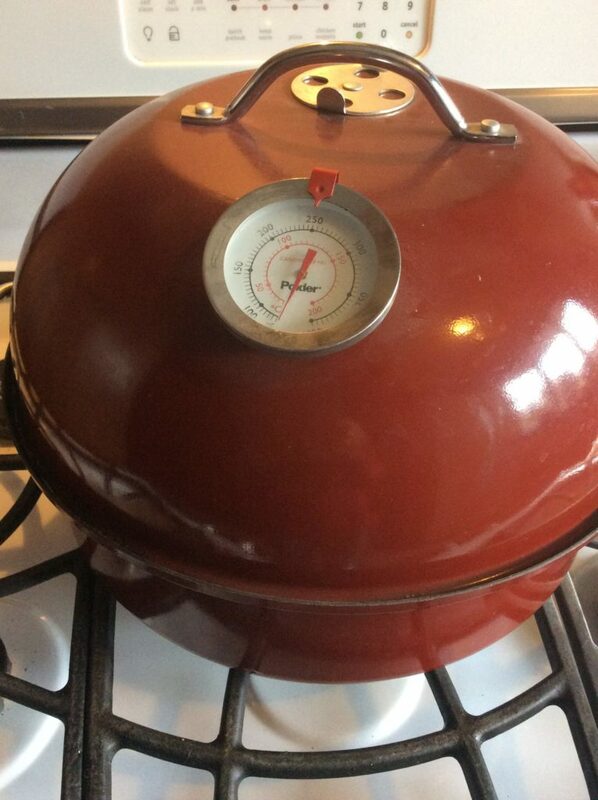 Here’s why I love cooking with the Orion Cooker. On a -2° winter day, I can still use the convection heat from the Orion Cooker to finish the German bratwurst in just 45 minutes. In fact, I don’t use a full fuel tray of briquettes for this smoke. Just one chimney starter full of coals plus about 15 unlit briquettes placed on top of the lit coals. 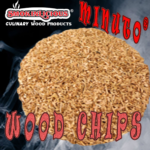 Great smoke flavor is added using Minuto® Wood Chips in wild cherry from SmokinLicious®. I’ve hung over 24 brat links on the three rib hooks of this unit so I can feed plenty of hungry people. Now comes the best part! 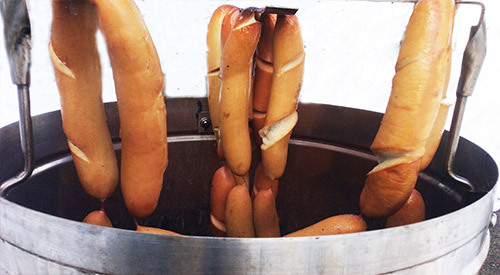 Fixing your bratwurst the way you love it. Put out a variety of toppings to stimulate creativity at the brat table. I’ve included raw chopped onion, sweet pickle relish, sauerkraut, hot Hungarian pepper rings, BBQ sauce, beer brat mustard, kimchi, horseradish sauce, just to name a few choices. Whether you slice your brat down the middle or leave it whole, anything goes. German bratwurst done over SmokinLicious® wild cherry wood chips and hung on the hooks of the Orion Cooker, for that old school, smokehouse flavor. Bratwurst in the Orion Smoker Cooker! Originally posted this on January 11, 2017 on their web site. The Alto-Shaam® Social Marketing Team made a request to have us post this to our Blog. We felt the content was a great value to our readers/followers! Please note that the wood chips outlined in this article are limited to only those that Alto-Shaam® has available. 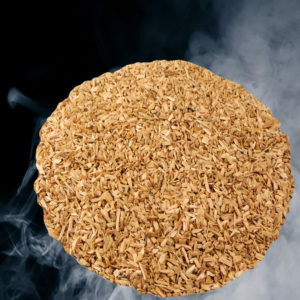 SmokinLicious® produces 8 species of smoker wood chips compatible to the Alto-Shaam® equipment. (Note: we do not produce Mesquite or Apple). Is it fresh, is always a question that comes from new customers only! 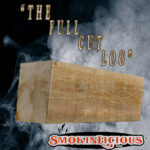 Our old customers know that at Smokinlicious® we are cutting products daily and measuring moisture to produce the best smoking wood in the world! I always find it interesting when we receive a new inquiry about providing specialty products for commercial-grade smokehouses. I’m speaking specifically to the large commercial-grade smokehouse. The type that utilize walk-in, wall smokehouse units that can turn out hundreds of pounds of product each cycle. First, there’s always the question if we can duplicate the current wood chip product. That’s where the education begins. Sending the current wood supply sample is key to determining what should be used in product. Once we provide the video review of what is in the sample in terms of sizing, we’re on the way to getting an understanding of why the current product may not be ideal. Our concern is not just the overall flavor and color to the finished product, but also to reducing equipment failures that may occur from clogging of the wood material due to dust particulants. Following our discussion on product sizing, it’s time to explain why ordering fresh product is key. We don’t operate on the concept that you need tons of extra product inventory sitting in your location, making the potential for color changes to the wood, moisture depletion, and susceptibility to mold spores a reality. Instead, fresh product is produced when you need it, allowing for consistency in your smokehouse products’ flavor and color. I know this is a stretch when there are many suppliers out there who encourage you to order pallet after pallet of product with the incentive of saving 10% if full truck loads go out. Good luck getting the premium flavor and color your looking for with that old, dehydrated product! We know every customer we have the privilege of doing business with needs assurance that we can cover their needs. That’s why our entire Team is involved to ensure that we can ship earlier if needed. We take the time to monitor your Company’s usage and predict your next order. Or, we can set up a shipping schedule you’re comfortable with that is easy for everyone involved and won’t require extra, valuable storage space be used. Yes, you could say we are not the norm and we’d be just fine with that. In fact, we encourage it. 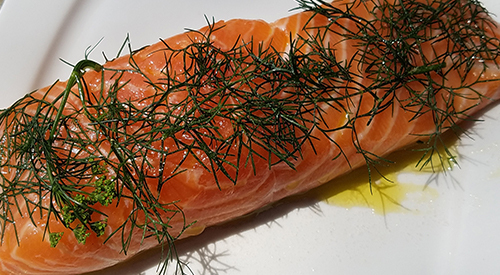 To us, there’s nothing like cooking with fresh product that has been designed with your Company’s needs in mind. That’s why our superior product will give you a superior outcome. Fresh hardwood product for unmatched smoke infused food products. That’s the SmokinLicious® way! -CAN HARDWOOD BE TOO DRY FOR COOKING? EASTERN ALDER ON THE LIGHTER SIDE! ON THE LIGHTER SIDE..EASTERN ALDER! 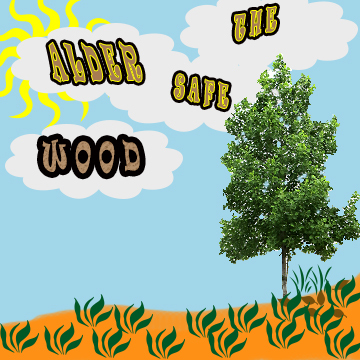 As we highlight another hardwood from our offerings, we need to start by pointing out that we are referring to Eastern Alder not the better known Western Alder or Red Alder of the west coast. Eastern Alder is part of the Birch family, with the scientific name of Alnus but the common names for the varieties found in the Western New York and Northwestern Pennsylvania regions of Eastern Alder (Smooth Alder), White Alder, Red Alder. Alder is a relatively soft hardwood of medium density. It is most commonly used with fish but I think I need to stress here that really any cooking hardwood can be used with any food item at the discretion of the cook. Many factors play in to how a hardwood reveals itself during the cooking event: rub ingredients, brine ingredients, quality of the meat/poultry/fish, freshness of the food item, style of cooking (over the coals, in the coals, indirect heat, etc.) and most importantly, oxygen flow which feeds the combustion of the wood. 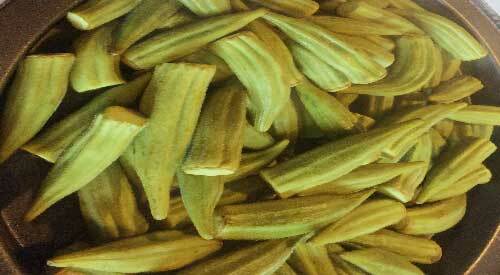 Alder provides a neutral coloring to the outer skin of foods which is why it is a favorite for fish. Would this be a first choice for say a steak or other beef item? No, but I certainly like to use it for lots of other things like fruit, vegetables, cheese dishes, and of course, fish. When you’re looking for something on the lighter menu of woods, keep Alder in mind, and explore its lighter heat level and versatility for the more delicate items of cooking. ELECTRIC SMOKERS: WHEN IS A WOOD CHIP DEAD? We discuss the Electric smoker and what the before chips and after chips!- When is a wood chip dead? The chips should have full combustion for the proper smoke flavor. 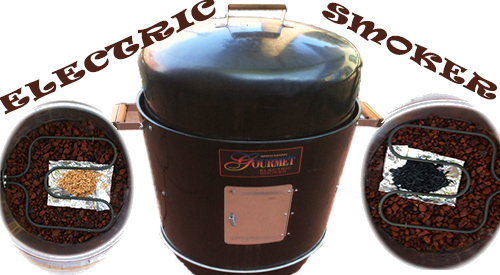 Without question, electric smokers are by far the easiest smokers to manage as they require no charcoal lighting, no constant checking of the fuel supply, and usually no messy ash pan. These are units that are designed to run on very little wood product, usually between 2-5 ounces because the actual ‘fuel’ is an electric coil. No gas, charcoal, or pellet. To answer the question of whether flavor differences exist between an electric unit and those that use combustible fuel sources, you need to weigh who the response is coming from. For me, someone who has an electric unit (we need to have a good assortment of equipment to produce our recipes), I do indeed feel there are flavor differences. Without the volatile gases that are produced with combustible items meaning wood and lump hardwood charcoal, there is less of a smoke flavor. The trademark smoke ring on meats can also go missing with electric units. Take this into consideration when deciding whether to purchase an electric unit. Electric smokers are very specific when it comes to the quantity of wood to use. Most manufacturers will provide a measurement level in ounces that you need to adhere to. If you should have an electric unit that does not include the reference to wood quantity but does have a wood tray, be sure not to overfill that tray. Most units use between 2-5 ounces of wood product to start. You may have to replenish the wood 1-2 more times depending on what your smoking. Larger cuts of meat, plan on enough wood to fill the wood tray three times. You followed the directions and placed the referenced amount of wood chip product in the unit but when the cooking time was finished, you looked at the chip tray and found most of the wood chips still in solid form. Nothing was reduced to ash and all the chips were black in color. Did something go wrong? Black color to the wood chips means that the wood processed through most of the stages of combustion and turned to carbon on the outside, giving the distinct black coloring. If the wood chips are still in sold form, then combustion was not complete. Complete combustion would have reduced the chips to a pile of carbon ash. To ensure complete combustion of a wood product specific factors need to be in place: air-fuel ratio, quality of the fuel, reduced moisture or water level, etc. The 3 ingredients that must be present to sustain combustion are oxygen, heat, and fuel. If you can achieve a balance of these 3 ingredients, you will achieve complete combustion and have great success with wood product used in an electric smoker. Can Black Chips Be Re-Used? The most important thing to remember about combustion is when wood is reduced to carbon, it produces very little if any smoke and has no flavor release. To answer the question of whether wood chips that are black but still in solid form can be re-used, the answer is no. Remove those black chips and add fresh, keeping the chips in the dry state when smoking with them. You’ll find better results and less waste in the wood product you purchase. Did you find When is a Wood Chip Dead helpful? Let us know and be sure to follow and subscribe to us as we bring you innovative ideas for adding wood-fired flavoring to all types of foods, the SmokinLicious® way! Our food scale demonstrates HOW MUCH WOOD TO ADD of Grande Sapore® and Double Filet wood chunks as a guide to adding wood flavoring with our Smokinlicious® products. Let’s break this down by equipment and method of smoking so you have a good place to start in answering the above questions. As a reminder, wood should not be sold or referenced by weight so I always recommend you keep a food scale handy to weigh pieces of wood or handfuls of wood chips until you get comfortable with eyeballing your needs. After working with wood on your specific equipment, you’ll develop a sense of how much will produce a smoke infusion level you and your food guests like. To make easier understanding of the amount of wood needed, I will be referencing by ounces in my breakdown lists. If you adhere to the basic rule of low temperature cooking on a smoker, then you’ll likely be cooking between 225° and 250°F. You will also likely be using lump hardwood charcoal or traditional charcoal known as briquets, for the fuel or heat. That is the material that keeps the smoker at a steady temperature. Regardless of whether you use the snake method, minion method, or simply dump the charcoal in the smoker’s charcoal area, wood will be needed in some form to provide the actual flavor to the foods being smoked. Why? Because wood is what gives foods that smoky flavor and distinct texture and appearance. 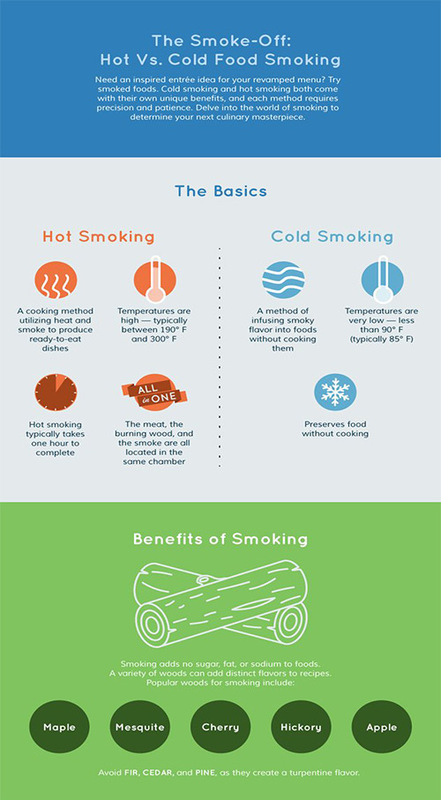 For the smoker, here is a guide on wood quantity based on food being smoked and for using wood chunks. 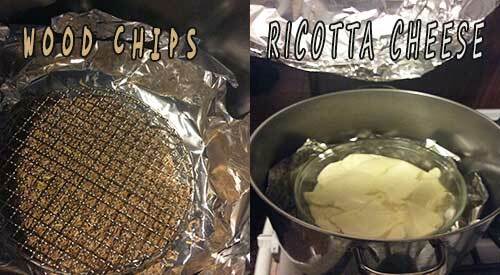 Note, you can smoke different foods at the same time with small adjustments to these amounts. For placement of the wood chunks, these can go directly on the hot coals with some wood banked to the side to catch as the hot coals spread. 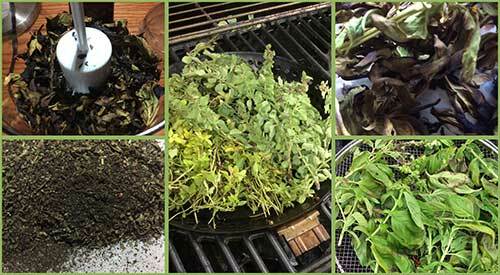 Essentially, you will be doing the same steps as above for the traditional smoker. The main difference between these two units is that smokers are for hot smoking and generally don’t do well when used for grilling. In fact, I would highly recommend you never try grilling on a smoker. Charcoal grills, on the other hand, can do both but you will have to make some airflow adjustments with the unit’s venting to ensure that you can maintain a low temperature consistently for smoking. You also may find adding a heat insulator like bricks or stones works well to attract and use radiant heat. 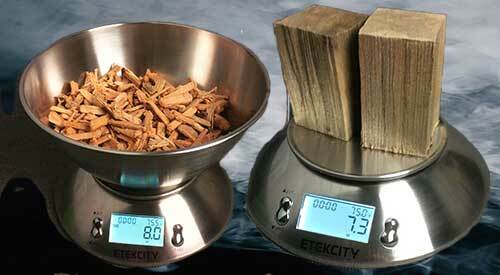 Here is the guide on wood quantity based on food being smoked as well as type of wood product. Remember, a wood chip product will combust faster so you will need more chips on hand when hot smoking. For placement of the wood chunks, these always go on top of the charcoal. You should have a piece on the hot coals and then stage some on unlit coals that will ignite during the cooking process and keep the flavor going. I think the key misnomer is that LP/Gas Grills can only use wood chips if you want to attempt to do wood-fired cooking. That has certainly changed with the advent of dual fuel or multi-purpose grills on the market today, as well as the development and design of diffusers over the gas burners for traditional grills. The heat covers on burners are the perfect place for wood chunks. Even if you don’t want to add chunks directly to a component of the grill, you can use a standard wood chip smoker box and simply put chunks in the box versus chips. Usually these boxes will hold 3-4 small chunks of wood. The box also aids in capturing ash. 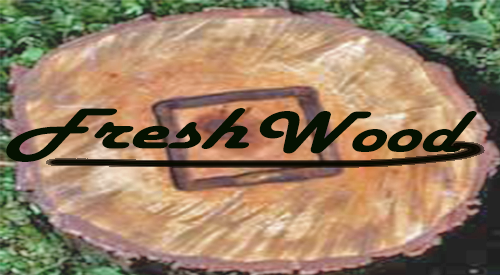 Here is a guide on wood quantity based on food being smoked as well as type of wood product. Remember, a wood chip product will combust faster so you will need more of it on hand than wood chunks when hot smoking. Also, keep in mind that if you’ve purchased a “green” wood or air-dried wood, it likely holds more moisture than a kiln dried wood. This will change the weight. Pieces of wood that fall into the “green” category, even if they are the same size, will weigh differently. Work with wood long enough and you’ll develop a feel for what is just about at the perfect weight for wood-fired cooking. With technologies advancing in the grill world you now have so many more options for using charcoal and wood in the convenience of a gas fired grill. For those looking to have that level of ease but the flavors of charcoal and wood at your fingertips, those equipment manufacturers are to be considered. Just get ready to make a substantial investment as these models do not come cheap. We hope this article provided you with new information. 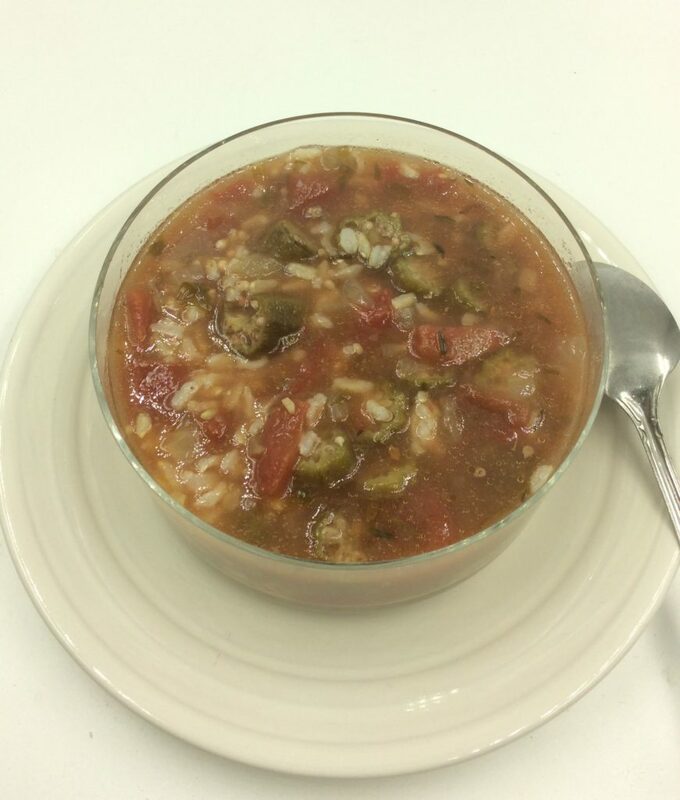 Leave a comment and remember to follow us on social media for additional tips, techniques, recipes, and great photos. As always, your suggestions on other article topics are always welcome. 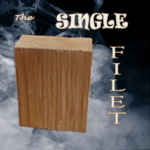 Hope you can use our blog HOW MUCH WOOD TO ADD WHEN SMOKING! WHY WON’T MY WOOD CHIPS SMOKE! 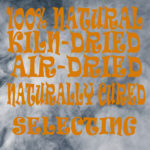 Kiwifruit gets smoky by adding a new twist to your kiwifruit by cold smoking it to enhance its wonderful sweet flavor. Kiwifruit is now in season! It’s time to use this potassium, vitamin A, C & E enriched fruit in your favorite recipes. How about doing something to up the flavor level a bit? Packed with more vitamin C than an orange and as much potassium as a banana, Kiwifruit, more commonly called kiwi, is also a fiber powerhouse. I’m going to take this creamy fruit favorite to a new flavor level by cold smoking it. To do this technique, you’ll need a handheld food smoker, SmokinLicious® Minuto® Smoking Wood Chips in size 6, 8 or 10, a lighter, a sheet pan, a food bag large enough to go over your sheet pan, and a cable tie. Then gather together the number of kiwifruits you’d like to infuse with smoke vapor, and have a knife and cutting board available. 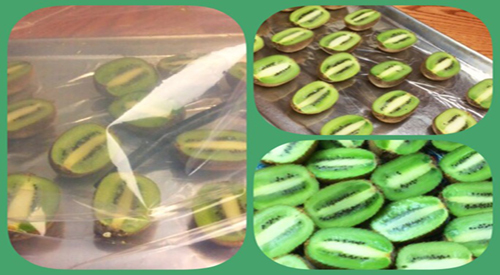 Simply cut your kiwifruit in half to allow the smoke vapor to penetrate the fruit flesh. As kiwifruit is covered by a brown, fuzzy skin, you will need some of the fruit’s meat exposed to get real smoke flavor incorporate. Otherwise, leaving them whole won’t bring much of a smokiness to the fruit meat. 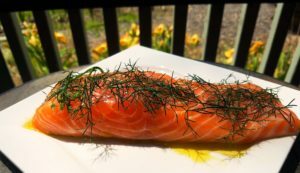 What I love the most about cold smoking with a handheld food smoker like The Smoking Gun™ Smoker, is how fast this flavoring can be done to any food, beverage, liquid, spice or herb item. After cutting me kiwifruit in half to allow for maximum penetration of the smoke vapor, I place the cut halves on a sheet pan. I then slip a food bag over the sheet pan. 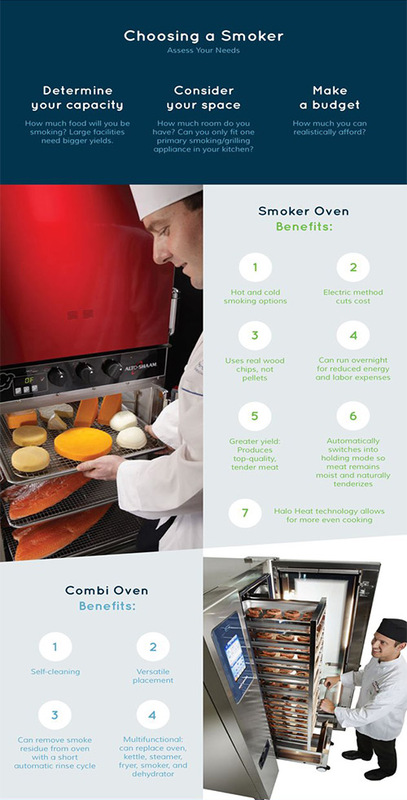 Time to prepare The Smoking Gun™ Smoker or other handheld food smokers you might have. I take just a pinch of Alder Minuto® Smoker Wood Chips and place in the bowl of the food smoker. I insert the tubing into the food bag, about ½ way back and gently draw at the end of the bag around the tubing. I’m now ready to turn the food smoker on and light my Alder chips. Once the smoke is dispensing at a good rate into the food bag, turn the handheld food smoker off and remove the tubing, cinching the food bag tight. I attach a cable tie to the end to keep it closed tight. Here’s a tip: have your cable tie pre-looped for easy application and less chance for any leaking smoke vapor. Allow the smoke vapor to remain in the bag until dissipated. If you want an extremely light smoke flavor, then feel free to release the smoke vapor as you see fit. For me, I will patiently wait for it to clear before releasing the cable tie on the bag. 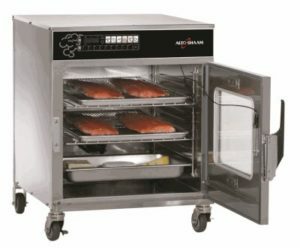 Not only are hand-held food smokers, like The Smoking Gun™ Smoker easy to operate and extremely fast at infusing smoke flavor, but they also generate a lot of smoke that can be easily captured. Although I’ve used a food bag over a sheet pan, feel free to place the kiwifruit on a plate fitted with a dome cover or simply use plastic wrap. Anything that can trap the smoke is ideal. You will see as the smoke is produced, it will travel throughout whatever container you’re using covering the entire food surface. Although this looks like a huge amount of smoke that would potentially produce strong or bold smoke flavor, I remind you that I am using a very mild hardwood – Alder – to infuse smoke flavor to the kiwifruit. I highly recommend whenever doing a fruit item – go with a milder hardwood for the infusion process. 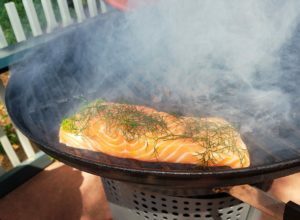 This simple method of using a handheld food smoker with SmokinLicious® Minuto® Smoking Wood Chips in Alder to add a mild smoky flavor to seasonal kiwifruit takes just 15 minutes. All of the nutritional benefits remain in this healthy fruit; rich in potassium, vitamins A, C, and E, as well as fiber. Think about all the things you can do with this super fruit: add it to a smoothie, cut it up for fruit salad, pair it with a grain like quinoa, rice, or farro, or simply enjoy it as is. For me, I’m thinking of entertaining so I will start with a cocktail recipe. Did you like this idea? If so, leave us a comment and let us know what you would love to see next. 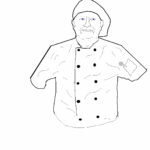 Be sure to follow and subscribe to us as we bring you innovative ideas for adding wood-fired flavoring to all types of foods. Check in next for my Smoked Kiwi Caipiroska, a flavorful cocktail featuring kiwifruit, mint, and vodka. More Related reading on Kiwifruit gets smoky and more!